Every time I start thinking of Clare and Henry I begin to get misty-eyed. Every time. Days after reading the book. Oh my gosh, I'm doing it again! Okay. Let's try to make it through this review. I have been avoiding reading this book for years. I own a copy. It's sitting on my bookshelf right now, in fact. 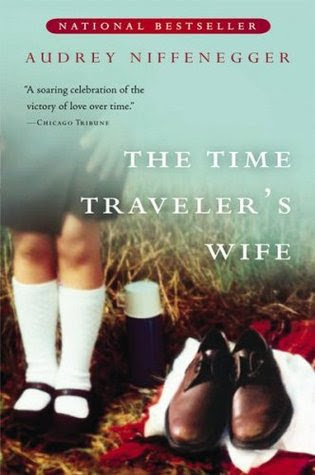 For years friends have recommended I read The Time Traveler's Wife. Some rather strongly. I said I would. I never did. Until the book arrived in the mail one day via my Postal Book Club. I was a little surprised given the page limit for books we're supposed to read is lower than the page count for this book--but it is a fast read, so maybe that was taken into consideration. I seem to be the first person in the group who hadn't read the book, which, upon reflection, isn't a surprise. I mean you all have read it, right? Most of you, anyway. The first time Clare meets Henry, she is six. The first time Henry meets Clare, he is 28. Both at completely different points in time. That sort of thing would complicate life, don't you think? It was interesting to see how their lives intersected, how Henry saw Clare grow up, him knowing he would eventually marry her; and then years later see an adult Clare meeting a version of Henry that hadn't encountered her yet as a child. I worried at first I would have trouble following the narrative, given the jumps in time and their unusual chronologically-challenged romance. The author made it easier by documenting the dates and ages of the characters over the course of the book which helped immensely. That, in part, made it easier to follow--that and such a compelling novel whose characters I grew to love. Neither Clare nor Henry are perfect, not really. Okay, so maybe a little close to perfect, but not quite. Henry, especially in his young adulthood (before Clare), was a bit of a rogue. He went through drugs, alcohol and women like they were a bag of potato chips. Clare, especially in her childhood, at times seemed precocious. They did not always agree and there were definitely tense moments throughout their marriage, especially when they were trying to have a child. My heart ached for them. I cannot even imagine what it would be like to be Henry, not being able to change the past, life just happening to you, really. No free will. I change my mind. I am glad I am not Clare and that I am not married to Henry. As much as I enjoyed reading this book and being caught up in the experience of being a part of Clare and Henry's world for a short time, I, at times, wished the author had taken the characters deeper, taken certain threads a little farther than she did. Yet there were times when she did, when she caught so perfectly the feeling of grief, the varying nuances of being both happy and sad to be alone, and the pure joy of being in love. When I finished the book, I felt for sure I was missing something. I wanted more. I wish I could say it was just that wonderful sense of wanting more because you don't want a book to end. While it is true I didn't want Henry and Clare's story to end, I also felt a little let down. I thought the very end was perfect. It's what happens--or doesn't--right before that that left me wanting. Is that too much of a spoiler? Probably. Which is why I won't say more. Other than to say, I have questions! At it's heart, The Time Traveler's Wife is a love story. It is about their courtship and eventual marriage. And it is about their life together, about the hardships they faced in living such an unpredictable life and yet trying to have a normal life just the same. My emotions as I read were all over the place. There was heartache. Lots of heartache. And yet, this is such a beautiful story of two people so utterly in love with each other. It's hard not to feel the joy in that. To learn more about author Audrey Niffenegger and her work, please visit the author's website. You can also find her on Facebook, Twitter, Goodreads. Source: Many thanks to Tanya of GirlXOXO for sharing this book with me through our postal bookclub! Melody - I waited to see the movie until after I read the book (I often prefer to do it that way). I'm so glad I did. I hate having books spoiled for me (but I don't mind that with movies) and this one would have definitely been one I probably wouldn't have read had I seen the movie first. I was disappointed by the movie. Hopefully you will like this one if you do read it. I saw the movie when it was in theater's years ago and loved it so I immediately bought the book and have let it linger on my shelves for far too long. I can tell you loved this book. Kathy - I was hoping I would love the movie, but I ended up being disappointed by it. I think it had it's good moments--and I still cried at the end. I really did love this book though. :( I'm afraid I am a lone reader who was not satisfied with this time travel story. Everyone else has loved it, but it just didn't work for me. Kay - I bought a copy years ago because so many people said I should read it. Like you though, I wasn't particularly drawn to it--which is why it stayed on my shelf so long. I'm glad I finally read it though. I haven't read Lightning, but you've got me curious now about Koontz's book. Given the types of novels he writes, I imagine it is quite different. I read that book, and loved it! Glad to hear you enjoyed it! Thanks for stopping by my blog! I read it a long time ago and I must have liked it as I kept it, I watched the movie too. Some people really disliked it but I wasn't one of them. Hope your well and the kitties are behaving whilst you try and read. Loved this book so much! Glad that you agree. I enjoyed her next book too - not as much as this one but pretty close. Athira - Yay! I am glad you loved it too. :-) I think I have her second book, now that you mention it . . . I've had this one waiting patiently for me on my shelves as well. I keep thinking that I will read it soon but never seem to pick it up. I am glad to hear that you enjoyed this one so much although I hate when endings disappoint. Great review Wendy! It took me quite a while to get to it. Hopefully if you do decide to read it, you will like it. To be honest I've never really been interested in reading this book though I've heard of it of course. After this review I'm definitely adding it to my TBR! With characters that stay with you that much and such a captivating story I just cant' resist! Thanks for such a wonderful review! Katherine - It sounds like quite a few of us weren't too interested in this one. I am glad I did finally get that push to read it. I ended up really enjoying it. I hope you like it if you do read it. I did have questions at the end, too! But it was such a wonderful book that I just focused on what I loved about it. Makes you think so much about love. Lisa - I'm glad I am not the only one left with questions. But yes, it was wonderful even despite that. :-) I'm glad you enjoyed this one too! Wow, I need to read this one. I've had it on my wishlist forever. If it makes you teary eyed even just thinking of it, it must be wonderful. Great review! Naida - I hope you like it if you do read it! It's worth it, I think. YEARS after reading this one, I still have chills thinking about it. I'll never forget finishing the book at about 2 in the morning and just SOBBING. There were a few parts that didn't connect for me and I remember going over and over them trying to pieces the parts together, but in the end it didn't really matter. I know just what you mean about falling in love with Clare and Henry. Loved them both. Glad this one didn't end up being too hyped for you--there's always that risk with a book that's so well-loved! Trish - Me too! I was sobbing at the end too. It's good to know both you and Lisa had a few issues with it--so it wasn't just me. Still, such a wonderful book! I think a lot of my reservations about this book had to do with the hype. I'm glad I wasn't disappointed. Now, the movie, on the other hand . . . I found that disappointing. I read this years ago, and now, after reading your review, I want to read it again!